March 29, 2012 - Bombardier Aerospace announced that its Vision Flight Deck entered service on schedule on a Global 5000 jet. The aircraft was delivered to Formula 1 champion Niki Lauda, a longtime Bombardier customer, during a special ceremony at Bombardier's Global Completion Centre, in Dorval, Canada. "The Vision Flight Deck is the realization of many years of efforts with our avionics partner Rockwell Collins and an industry first, featuring the implementation and certification of Synthetic Vision imagery on a head-up display (HUD)," said Steve Ridolfi, President Bombardier Business Aircraft. "We are thrilled to share this important milestone with our longtime customer Niki Lauda, a pilot himself, who will surely appreciate the enhanced experience of flying a Global aircraft." 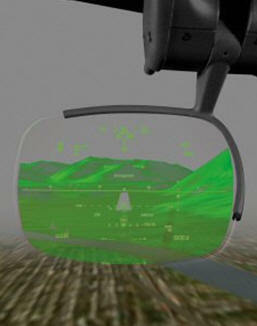 Bombardier Aerospace and Rockwell Collins are the first to certify synthetic vision imagery on a HUD as part of the Pro Line Fusion avionics system on the Vision Flight Deck. The Vision Flight Deck for Global jets received EASA certification on February 20, 2012, FAA certification on February 29, 2012, and Transport Canada (TC) certification on June 3, 2011. "I am very excited to be the first to own and fly a Global 5000 jet with the Vision Flight Deck," said Niki Lauda. "Flying a Global aircraft is an incomparable experience, and I'm convinced that the new flight deck will not only meet but surpass my expectations." Three-time Formula 1 World Champion Niki Lauda has a long history in aviation. He was the founder of Air Lauda in 1979, and in 2003, he founded FlyNiki, which is currently the second largest airline in Austria. The Global 5000 jet is the latest in a series of Bombardier business aircraft that Mr. Lauda has owned and piloted during his career as an aviator. Until recently he operated a Challenger 300 jet as his private aircraft, which he frequently used to travel to Formula 1 races around the world from his home base in Austria. A breakthrough in business aviation, the Vision Flight Deck is designed to deliver a completely new cockpit experience. By combining the best in technological advancements with superior designer aesthetics, it provides pilots flying Bombardier Global aircraft an unprecedented level of control and comfort. The Vision Flight Deck introduces the Rockwell Collins Pro Line Fusion avionics suite, providing an integrated flight deck to ensure interoperability between systems. Pro Line Fusion for the Vision Flight Deck on Global aircraft features four high-resolution 15-inch diagonal active matrix liquid crystal displays (LCD) arranged in a T-shape working in concert with the head-up Guidance System (HGS? ), personalized formats of display information, an electronic checklist, maps with graphical flight planning, an integrated cursor control panel, a Synthetic-Enhanced Vision System, paperless operation enabled by Dual Electronics Charts, a Future Air Navigation System (FANS), Controller-Pilot Datalink Communication (CPDLC), a Wide Area Augmentation System (WAAS), Localizer Performance with Vertical Guidance (LPV) and a MultiScan? Weather Detection system.